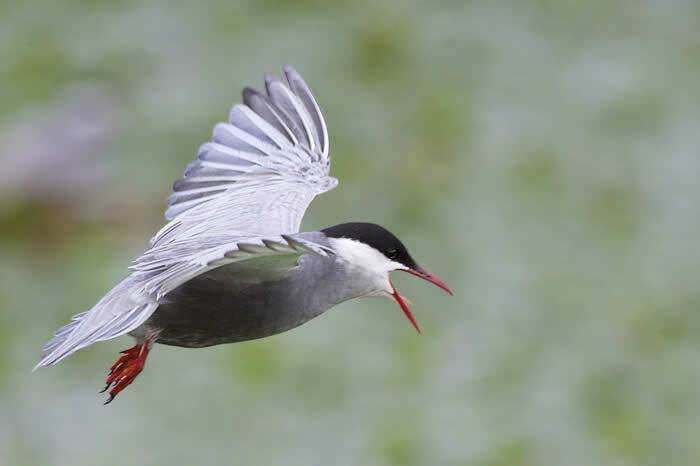 This web page is to share some pictures — still and moving images — of whiskered terns in the Danube Delta. There are many special moments on a visit to the Danube Delta and everyone will have their favourite. This was mine, writes Chris Durdin, from the Danube Delta holiday in June 2014. "The rain, though dramatic, was short-lived. It had stopped by the time we came into a medium-sized lake. Here we drifted towards a mat of floating vegetation, turned off the engine, watched and listened: cast away in the middle of a whiskered tern colony. "We’d seen many whiskered terns before, often picking up strings of water weed, sometimes visible on nests, but here we were surrounded by scores. The water weed was for building shallow nests of vegetation, added to the natural floating raft. The terns were sometimes in pairs by the nests, or standing singletons while partners were flying, fishing and calling. "It was a magical, noisy, unforgettable experience." These movies - click through to see them on YouTube - were taken with a hand held compact digital camera, so please forgive a little shake here and there. Do have volume on: the noise of a whiskered tern colony is quite striking. Click either on the red writing or the thumbnail picture to see the movies. Video 1 is as the Ibis Tours boat moves gently in a small lake on the Danube Delta, alongside a colony of whiskered terns. Video 2 shows several nesting pairs of terns, and some flying to and fro. Listen out for the cuckoo. 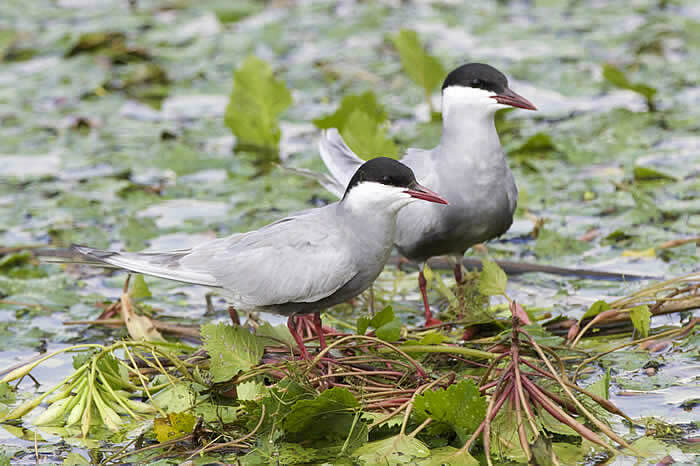 Video 3 is a close-up of a pair of whiskered terns on their floating nest of vegetation. A few weeks later ... try here for a more professional film that shows tern chicks in Romania. The tern nests were on floating sheets of water chestnut, close-up above. This water chestnut (or water caltrop) Trapa natans is different from the edible plant of the same name, a sedge Eleocharis dulcis, the corms of which are often eaten in Chinese food. From the same holiday, see also our photospots on the Danube helleborine and Dark Spreadwing. Photos by Honeyguider John Long and Chris Durdin.